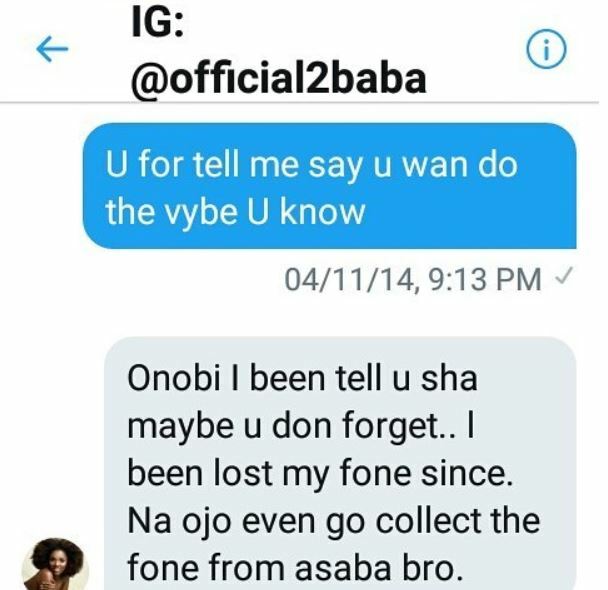 Following the ongoing rift between Blackface and 2Baba, the former have posted on social media a chat evidence of 2Baba admitting to theft on his intellectual property. The chat which was dated 2014 shows how Blackface told 2Baba he should have informed him before recording his song “Letsomebodyloveyou” while 2Baba responded by stating the uncontrollable circumstances as to why he could not reach him. Sometimes people push you to the wall and you have no choice but to fight back. This is one of my conversation some years back with @official2baba when i Asked him why did he record my song #Letsomebodyloveyou without my #permission and this was his reply saying he thought he told me but really he didn’t..
and why add your manager as a writer also? so you guys can steal my publishing money? And when asked why you stole my song #Letsomebodyloveyou you Tuface said it wasn’t true and maybe my twitter Account was hacked N after which you unfollowed me but I had this saved for many many years so you can see the level of lies you been feeding fans and people all along . This is why you n your creepy agents are trying to silent me via social media n avoid meetings to resolve this, but Jah has got my back OK . I have more evidence to this effect in case the need for it arises ok tuface & Efe omoregbe & company .